This is part 3 of a 4-part series — see also Myth #1: The Duck Curve limits renewables integration, Myth #2: Excess renewables must be curtailed or stored, and Myth #4: Natural gas is the main reason for decreased emissions. 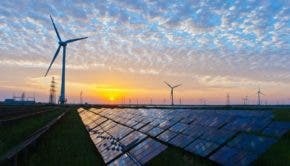 Outdated data or highly conservative cost assumptions for energy sources also tarnish renewable energy’s reputation as a cost-effective option for decarbonization. Innovation in renewables, battery storage, and other technologies is occurring at a breakneck pace, and the newest capacity and price data are often underestimated or aren’t released quickly enough to accurately inform important decisions by policymakers or grid operators. For example, the National Renewable Energy Laboratory’s (NREL) 2012 Renewable Electricity Futures study showed that moving to 80% renewable energy by 2050 was technically feasible with moderate cost increases under conservative technology improvement assumptions. A 2014 update to the study found its most ambitious estimates for cost reductions by 2050 had already been reached in the real world in 2014, meaning the same study produced zero cost increases when using today’s actual data. JP Morgan’s Brave New World report falls victim to this fallacy by relying on outdated costs for solar in the vast majority of its scenarios. Its Current Costs scenario models solar photovoltaic costs at $2.25/watt-AC for projects delivered in 2016–2018. However, US prices recorded in Q3 2015 are already 12–23% below this, and Germany’s prices are even lower. Rather than projecting cost declines as part of the current trajectory, their study mistakenly assumes costs will stay fixed to 2050. Analyses must use up-to-date costs and reasonable price projections to properly inform power sector decision-makers. One of the most commonly held myths about a low-carbon transition is that a high penetration of renewables costs electricity customers more money. This myth stems from looking at electricity rates ($/kWh) rather than electricity bills ($ for service), which are what ultimately matters to customers. Focusing on rates instead of bills fails to account for energy efficiency improvements and load changes, both of which reduce the actual price customers pay for reliable service. To understand total system costs, it is important to look at the cost of generation as well as the total number of customers and total amount of demand. For instance, even though California has a relatively high electricity rate, its customers have some of the lowest bills in the country, thanks in part to aggressive energy efficiency policies the state has pursued. In many cases, efficiency measures lowering energy consumption can offset any increase in rates, lowering electricity bills overall. It is true that expensive feed-in tariffs and early subsidies for renewable energy come with a net cost, but the era of paying a large premium for renewable energy is essentially over. Renewable energy is increasingly beating existing fossil fuel–fired generation on price alone. For example, when Colorado issued a request for proposals to replace 900 MW of coal-fired generation with renewable sources in 2013, over 6 GW responded and the winning bids were lower than the average price of generation, bringing down the cost of energy and saving Colorado customers money. Palo Alto’s municipal utility recently approved a purchase power agreement for utility-scale solar at $0.037/kWh, which is below the average levelized cost of electricity for natural gas and coal. This counters the recent threat by National Association of Regulatory Utility Commissioners President Travis Kavulla that renewable energy will raise costs and enrich utilities. As state and federal policies provide consistent demand for greater renewables deployment, costs will continue to fall. Furthermore, these low prices carry through to wholesale markets, where adding renewable energy lowers prices, making electricity cheaper on average and creating savings for customers. Increased renewables penetration can also help lower the costs of uncertain fuel prices consumers are forced to pay. Fuel-based energy sources like natural gas or coal are vulnerable to price fluctuations, and utilities generally pass these costs through to their customers, exposing them to price volatility. Even if fuel costs are low for a time, price uncertainty is expensive since a large rise or fall can have wide-scale ripple effects throughout the economy, affecting business investments and consumer spending. A high penetration of renewables, which have zero fuel costs, helps to eliminate this volatility.